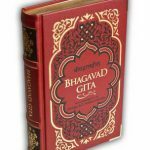 On September 21st, Bhaktivedanta Vidyapitha announced the release of the book Bhagavata Subodhini, which is an effort to deeply and easily understand the subject matter of Srimad Bhagavatam and Srila Prabhupada’s commentary on it. The book was released by Jananivas Das the head pujari of Mayapur and the most senior and respected pujari in ISKCON. 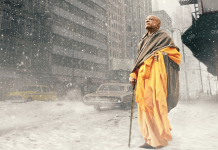 On the order of Srila Prabhupada, he had shifted to Mayapur and took up the seva of being a pujari. 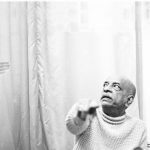 He and his brother, Pankajanghri Das have been serving in Mayapur for many decades. 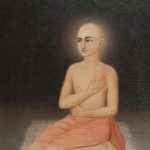 Articles on special verses – This section is dedicated to in-depth and comprehensive analysis on a particular verse or a string of vital verses, based on the commentaries of Vaisnava acharyas. 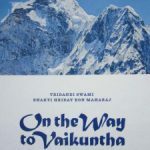 Thematic compilations – This section consists of multiple prominent themes that are present in the specific cantos of the Bhagavatam. 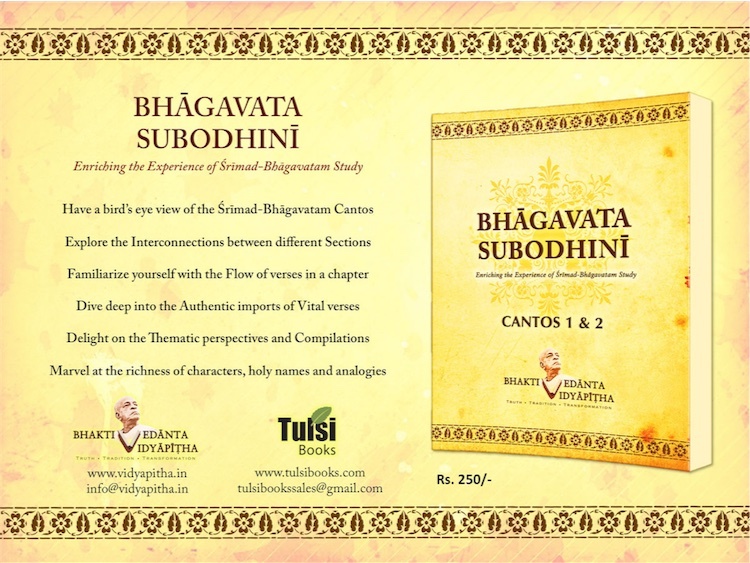 The objective of this section is to make the readers appreciate the cross sectional view on a specific theme revealed in various chapters of a canto, in addition to inspire one to study the Bhagavatam from various angles like descriptions of the lord, important philosophical extractions, special sections elaborated based on commentaries, etc. Appendix – The extensive lists of reference material from the cantos are presented in this section. Unlike the thematic compilations section, these materials are more or less direct in nature with little or no analysis. 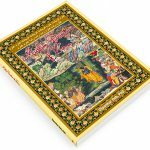 Examples of such topics are the names of Krishna, analogies, verses with common themes, etc. On 27th September, Bhagavata Subodhini promo was shown during the GBC Leadership College sessions organised at Govardhan Eco village and the book was presented to Bhakti Charu Maharaja who appreciated the efforts of publishing the book. 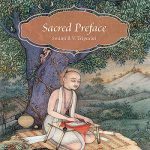 During his talk he mentioned that personal association of Srila Prabhupada can be obtained through his books. He congratulated the Bhaktivedanta Vidyapitha students for connecting with Srila Prabhupada book and compiling Bhagavata Subodhini.